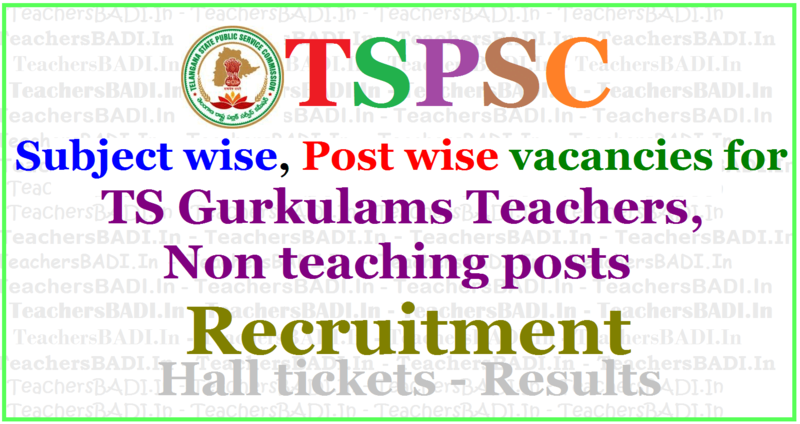 Subject wise,Post wise vacancies for Tspsc Teachers,non teaching posts recruitment 2017 : TSPSC teachers job vacancies, Teaching posts vacancies for TSPSC gurukul teacher recruitment, Gurkulam Teacher vacancies, Non Teaching post vacancies, Telangana jobs: TSPSC gurukul recruitment notification 2017, Subject wise TGT posts Vacancies in treis, tswreis, tmreis, ttwreis, mjptbcwreis boys/girls residentials; Subject wise PGT posts Vacancies in treis, tswreis, tmreis, ttwreis, mjptbcwreis girls/boys residential schools; PET,PD Posts vacancies in Gurukulams for TSPSC Recruitment 2017, Staff nurse, Librarian posts vacancies in REI Societies for TSPSC Telangana Recruitment, Art,Craft,Music Teacher posts vacancies for TSPSC TS Residential Schools Recruitment, PET, PD Posts vacancies in Telangana gurukulams. TSPSC gurukul teachers recruitment notification 2017 out, apply for 7,306 posts from Feb 10. Telangana State Public Service Commission has issued notification to fill 7,306 vacancies under Residential Educational Institutions Societies (REIS) on its official website. The online application process for the exam starts on February 10 and will end on March 4, 2017. The examination is being conducted to select 4,362 Trained Graduate Teachers (TGT), 921 Post Graduate (PG) Teachers (PGTs), 6 Physical Director (School), 616 Physical Education Teachers (PETs), 372 Art Teachers, 43 Craft Teachers, 197 Music Teachers, 533 Staff Nurses and 256 Librarian (schools). Art teacher, Craft teacher, Music teacher, Staff nurse: The online examination (objective type) for art teacher, craft teacher, music teacher, staff nurse is likely to be held on April 2, 2017. For PD: Physical director (school) and post graduate teachers the preliminary (screening test) is likely to be held on March 19 and the main examination (objective type) is likely to be held on April 23. For TGT: Trained graduate teachers the preliminary (screening test) is likely to be held on March 19 and the main examination (objective type) is likely to be held on April 30. For PGT: Post graduate teachers the preliminary (screening test) is likely to be held on March 19 and the main examination (objective type) is likely to be held on April 24. For Librarian: Librarian (school) the examination (objective type) is likely to be held on April 16, 2017. Relax norms for Gurukul teachers - Chief Minister K Chandrashekar Rao had instructed the officials of Telangana State Public Service Commission (TSPSC) not to insist on 60 per cent marks in qualifying examination for the recruitment to teachers in Gurukuls in the State. KCR has instructed the officials concerned to follow the guidelines of the National Council for Teachers’ Education (NCTE) and several directives given by the courts while preparing guidelines for the appointment of the teachers in residential educational institutions in the State. The aim should be to offer quality education with high standards and to appoint the unemployed and eligible youth for the teachers’ posts. As per the guidelines of the NCTE, candidates securing 50 percent of the marks are eligible to apply and hence, all those who secured 50 percent should be allowed to apply without insisting on the conditions that they should obtain 60 percent to apply for the posts. This will help more and more unemployed youth to appear for the examination, the Chief Minister said. The Chief Minister also wanted to remove the condition that the candidates should have at least three years of teaching experience. He wanted all those candidates who have a degree; B Ed qualification along with the TET eligibility should be given a chance without any other experience. He also reviewed the demand that the examination should be held in Telugu medium. He also examined the guidelines of the NCTE and various verdicts given by the courts on the matter. Under the Supreme Court guidelines, there is no scope for the candidates to write the examination in Telugu medium, hence they have to appear for the examination in English, he said. The Chief Minister asked the officials concerned to prepare the guidelines accordingly.